SKU: T105. Listed in: Eyelashes. Tags: Black, Eyelashes, Gold, Gold and Black. 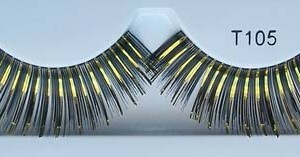 Gold and black eyelashes stick on with glue. Easy to apply. Perfect for Cleopatra.